This article was originally published by The Hill on February 12th, 2019. The mayor’s website states the city is “pursuing new local law to seize upwards of 40 of the most distressed multiple dwelling buildings annually and transition them to responsible, mission-driven ownership.” As a policy proposal, this plan is highly questionable; it’s unlikely the mayor will address the city’s affordable housing shortage by making things more difficult for property owners. In fact, one skeptical City Council member, Robert Cornegy, has already raised pertinent questions about the administration’s ability to execute this plan competently. But there’s a more urgent reason the City Council should reject the mayor’s calls to seize these buildings and transfer them to new owners: his plan would violate the New York Constitution. Article 8, Section 1 of the state constitution states: “No county, city, town, village or school district shall give or loan any money or property to or in aid of any individual, or private corporation or association.” Commonly referred to as the “gift clause,” this section prevents cities from gifting money or resources to a private organization. Most states have a similar clause to ensure that public money and property remain public, and to protect the rights of property owners against abusive and vindictive public officials. 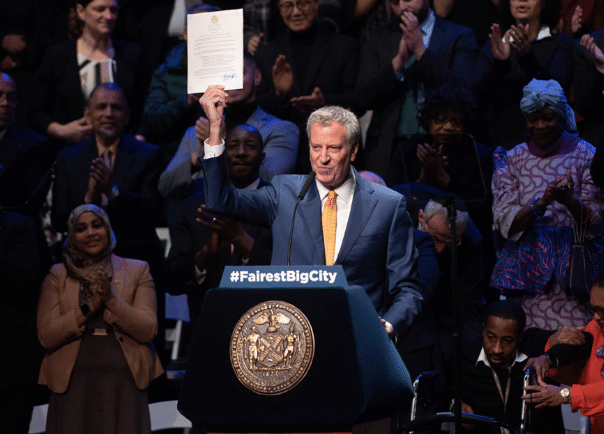 Although the details of De Blasio’s plan are few, the proposal seems to run afoul of the gift clause. Here’s what we know of how it might work: The plan would be carried out by the Office to Protect Tenants, a new agency aimed at defending tenants who allege abuse by landlords. The city would use its power of eminent domain to seize private property and then convert it to public property. The city would then gift this property to a community nonprofit corporation. De Blasio’s plan to transfer the property to a nonprofit, rather than a for-profit corporation, is irrelevant. Nonprofits are “private corporations,” unlike cities, towns and villages, which are public corporations. The gift clause also prevents transfers to individuals. So even if the “mission-driven ownership” were a group of individuals, the state constitution would still restrict the city’s actions. In order to comply with the gift clause, any transfer of property from the city to a nonprofit (or private individuals) would have to be for a public purpose, and would have to be for adequate consideration (payment) in return for the property. Complying with the other requirement — the payment of a consideration — will prove more difficult. In order to transfer property to a nonprofit, the nonprofit would have to pay the city a fair price in return. Although courts may grant some leeway in what they consider a fair price, it is hard to imagine a nonprofit being able to pay anywhere close to fair market value for residential property in New York City. When De Blasio took the oath of office, he swore to uphold the Constitution of the State of New York. But with his stated proposal to seize property and give it to nonprofit corporations, he’s put forth a plan that violates a vital constitutional principle. If the mayor is to uphold his oath, he must abandon this extreme proposal for dealing with landlord-tenant disputes.